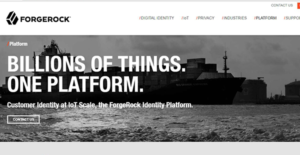 What is ForgeRock Identity Platform? ForgeRock Identity Platform is an open-source identity and access management (IAM) software that automates user management lifecycle for businesses in government, healthcare, retail, financial services, and communication & media. It is an innovative solution that securely connects devices, people, and things, so everything and everyone can easily interact in the modern Internet of Things (IoT) environment. The platform implements the User-managed Access protocol and functions as a federated identity program to help users manage all facets of shared data with all data providers. ForgeRock Identity Platform combines it customer identity & access and employee SSO management capabilities to bring a comprehensive solution that performs more than a legacy IAM application. Some of its main modules include access management, identity management, identity gateway, directory services, edge security, analysts report, and profile & privacy management. ForgeRock Identity, Platform administration console, features an XUI framework that is built for ease of use. The console supports easier configuration and provides realm-centric administration while presenting a time-saving, common task wizard. It’s a flexible solution that can scale to handle innumerous identities and support critical systems for traditional user sessions and multifaceted access requirements. The solution offers both stateful and stateless session architecture that support mission-critical and large-scale deployments. The stateless architecture is ideal for massive scale and elastic cloud-based deployments and can easily scale into millions and even billions of identities. The platform offer flexible and modular authentication management that enable companies to limit interruption of the omnichannel user experience. It allows you to activate a granular approach to IAM management to deliver enhanced end-user experience while boosting security through increased authentication signals. The platform provides a central digital workspace that combines with the privacy & profile dashboard and push notifications for authorized transactions making it easy to comply with the European Union’s GDPR regulations. Additionally, ForgeRock Identity Platform brings the implementation of User-Managed Access standards to the market. It allows you to visualize data access in real-time and modify access to your shared data thereby providing an unprecedented control against data access. By providing customers and employees with self-managed data access, the threat of security breaches by inappropriate utilization of authorized data is cut by a great deal. If you are interested in ForgeRock Identity Platform it might also be sensible to examine other subcategories of Best Identity Management Software gathered in our base of B2B software reviews. There are well-liked and widely used solutions in each software group. But are they essentially the best fit for your company’s unique wants? A popular software application may have thousands of users, but does it present what you require? For this reason, do not blindly shell out for popular systems. Read at least a few ForgeRock Identity Platform reviews and mull over the factors that you wish to have in the software such as the price, main features, available integrations etc. Then, shortlist a few systems that fit your requirements. Check out the free trials of these apps, read online opinions, get clarifications from the maker, and do your investigation thoroughly. This in-depth research is certain to aid you find the best software solution for your organization’s specific needs. How Much Does ForgeRock Identity Platform Cost? ForgeRock Identity Platform doesn’t reveal its enterprise pricing details. Contact the vendor for a custom price quote. We realize that when you make a decision to buy Identity Management Software it’s important not only to see how experts evaluate it in their reviews, but also to find out if the real people and companies that buy it are actually satisfied with the product. That’s why we’ve created our behavior-based Customer Satisfaction Algorithm™ that gathers customer reviews, comments and ForgeRock Identity Platform reviews across a wide range of social media sites. The data is then presented in an easy to digest form showing how many people had positive and negative experience with ForgeRock Identity Platform. With that information at hand you should be equipped to make an informed buying decision that you won’t regret. What are ForgeRock Identity Platform pricing details? What integrations are available for ForgeRock Identity Platform? If you need more information about ForgeRock Identity Platform or you simply have a question let us know what you need and we’ll forward your request directly to the vendor.